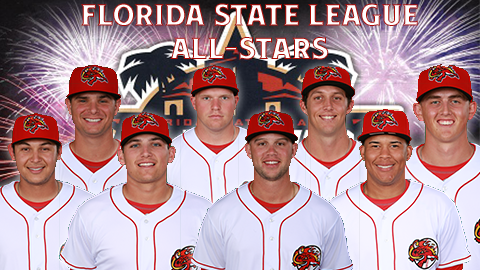 KISSIMMEE, Fla. (June 1, 2017) - The Florida State League announced its mid-season All-Star selections for the 2017 season, and the Florida Fire Frogs pace the North division with eight representatives. The Atlanta Braves High-A affiliate will feature five position players and three pitchers at Publix Field at Joker Marchant Stadium on Saturday, June 17 in Lakeland, Fla. The position players include Alex Jackson , Carlos Castro , Austin Riley , Tyler Neslony and Braxton Davidson , while the pitchers will be Drew Harrington , Tyler Pike and Devan Watts . Jackson leads the club with 10 home runs, but has missed the last 12 games due to a stint on the disabled list. Riley paces the team with 35 RBI and 52 hits; Castro has a team-leading .341 batting average, but missed 17 games because of a trip to the DL. The 23-year-old first baseman would rank third in the league in average if he had enough at-bats to qualify for the league leaders. Neslony comes into Thursday's contest against the Clearwater Threshers on a team-high 11-game hitting streak, in which the 23-year-old has gone 14-for-42 (333avg.) with seven driven in. The product of Texas Tech took over as the primary first baseman when Castro spent time on the disabled list. Davidson leads the Fire Frogs with 34 walks drawn on the year in 46 games, and is third on the team with an OBP of .362 amongst those who have played in more than 30 games. Harrington and Pike are tied for the team-lead with four wins apiece. Pike is leads all of Florida's starters with an ERA of 2.20 (14er/57.1ip), and is second on the club with 58 strikeouts in 10 games. Watts hold the team lead with four saves on the season, and has collected 27 punchouts in just 20.2 innings of relief. The North Division will be managed by Jay Bell from the Tampa Yankees. Publix Field at Joker Marchant Stadium is the Spring Training home of the Detroit Tigers. Game time is 7:00 p.m., with pre-game festivities beginning with a home run derby at 5:15 p.m. Gates will open at 4:30 p.m. Fireworks and a Garth Brooks Tribute Concert will be the post-game entertainment. Florida will look to pull back ahead in the series in game three of the four-game set on Thursday night at Spectrum Field. RHP Enderson Franco (0-3, 8.68) takes the mound for the Fire Frogs against RHP Jacob Waguespack (2-2, 3.08) for the Threshers. First pitch is scheduled for 7:00 p.m., with coverage starting at 6:45 p.m on the Florida Fire Frogs Broadcasting Network. The Florida Fire Frogs return to Osceola County Stadium on Saturday, June 3 for game one of a four-game series against the St. Lucie Mets.